Michelangelo was a conscientious student of human anatomy and enthusiastically dissected corpses throughout his life, but few of his anatomical drawings survive. This one, a depiction of the human brain and brain stem, appears to be drawn on the neck of God, directly above the altar in “The Separation of Light From Darkness,” another panel from the series of nine depicting scenes from the Book of Genesis. God, clothed in flowing red robes, is viewed from below and foreshortened, and seems to be rising into the sky. His arms are raised above his head, and he faces up and to his right, exposing his neck and the underside of a short beard. 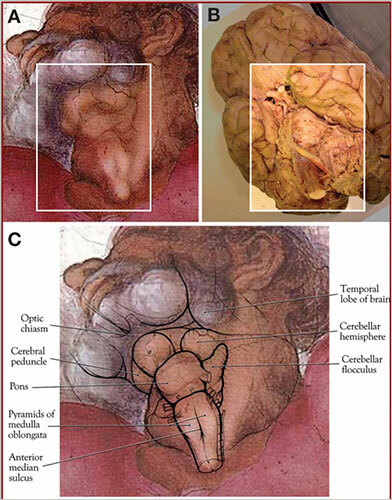 It is here that the study’s authors, the medical illustrator Ian Suk and Dr. Rafael J. Tamargo, a neurosurgeon, believe that Michelangelo concealed a drawing of the underside of the brain and the brain stem, with parts of the temporal lobe, the medulla, the pons and other structures clearly drawn. God’s beard, usually depicted as long and flowing, appears here short or rolled up to expose the neck. Light provides another hint. The fresco is illuminated from the lower left, but on God’s neck light shines head-on and slightly from the right. The authors insist that Michelangelo, a master of the depiction of light, could only have done this to draw attention to that part of the painting. A woman's body shape may play a role in how good her memory is, according to a new study. The more an older woman weighs, the worse her memory, according to research released this week from Northwestern Medicine at Northwestern University in Evanston, Illinois. The effect is more pronounced in women who carry excess weight around their hips, known as pear shapes, than women who carry it around their waists, called apple shapes. The reason pear-shaped women experienced more memory and brain function deterioration than apple-shaped women is likely related to the type of fat deposited around the hips versus the waist. Former US President George W Bush has created an account on the social networking website Facebook. His account was given the thumbs up, or "liked", by over 20,000 users within its first few hours. Click here to go to his page. Guillermo del Toro will no longer direct the two movies based on JRR Tolkien's The Hobbit, reports said. "In light of ongoing delays in the setting of a start date for filming The Hobbit, I am faced with the hardest decision of my life," he said. However, del Toro added that he will continue to co-write the screenplays. The project - which has already been delayed for several years - is expected to last longer than originally expected. Executive producer Peter Jackson reportedly said Del Toro could not commit to living in New Zealand for that long. The Hobbit was due to be split into two films, both prequels to Jackson's Oscar-winning Lord of the Rings trilogy - to be released in 2012 and 2013. It's official. Scientists in the US have succeeded in developing the first living cell to be controlled entirely by synthetic DNA. The researchers constructed a bacterium's "genetic software" and transplanted it into a host cell. The resulting microbe then looked and behaved like the species "dictated" by the synthetic DNA. The researchers copied an existing bacterial genome. They sequenced its genetic code and then used "synthesis machines" to chemically construct a copy. Amazing. Of course, the ethical discussions are yet to come. Otto Bock Healthcare, has developed a mind-controlled technology, which is ready to leave the laboratory and be put to everyday use. It involves a new technique known as targeted muscle reinnervation (TMR), where nerves that once controlled a lost limb are used to control a prosthesis. The transplanted nerves allow electrical impulses from the brain to reach the muscles in the chest. The muscles act like a booster, amplifying the signal to a level that can be picked up by electrodes on the surface of the chest. These signals are interpreted by a micro-computer, and used to control a prosthesis which responds in real time to thoughts from the brain.